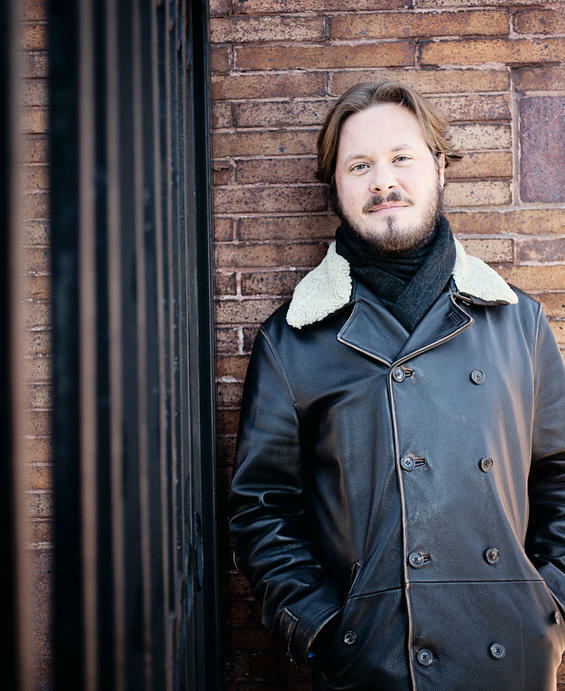 The downtown of any city is vital to that city’s identity, and St. Louis is no different. Dominated by skyscrapers, including buildings by some of the most important architects in history, downtown also suffers from an abundance of the opposite of density: parking lots. Battered, reviled, beloved and showing strong signs of a residential comeback, the future of downtown seems bright. After earlier controversies over the destruction of the Century and Ambassador buildings in the last decades, the remaining abandoned historic office buildings seem safe from outright demolition, even if some still sit neglected. The heart of St. Louis, downtown needs extensive coverage. Below are assorted important historic buildings critical to the character of downtown; as needed, more buildings will join this list. Designed by Thomas P. Barnett and completed in 1913, the Arcade featured a large shopping arcade on its first two floors. 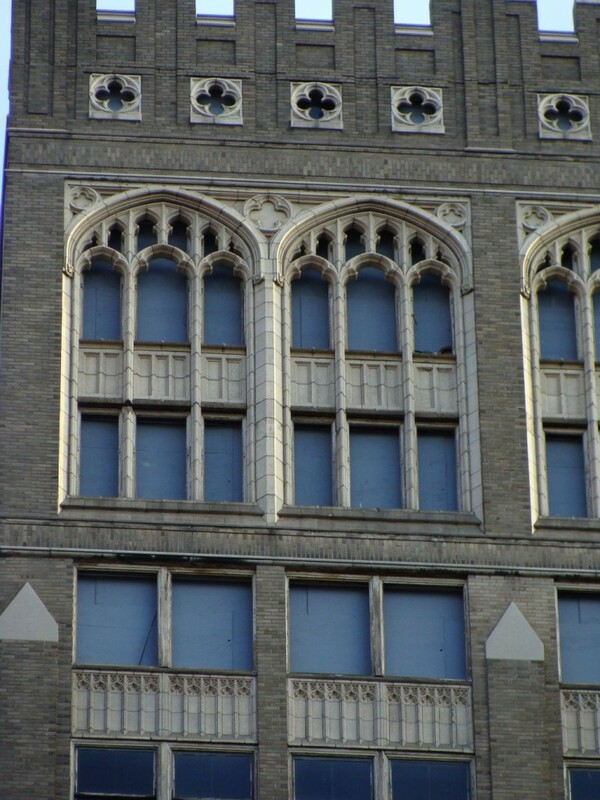 It is easily the tallest Gothic Revival inspired skyscraper in downtown. 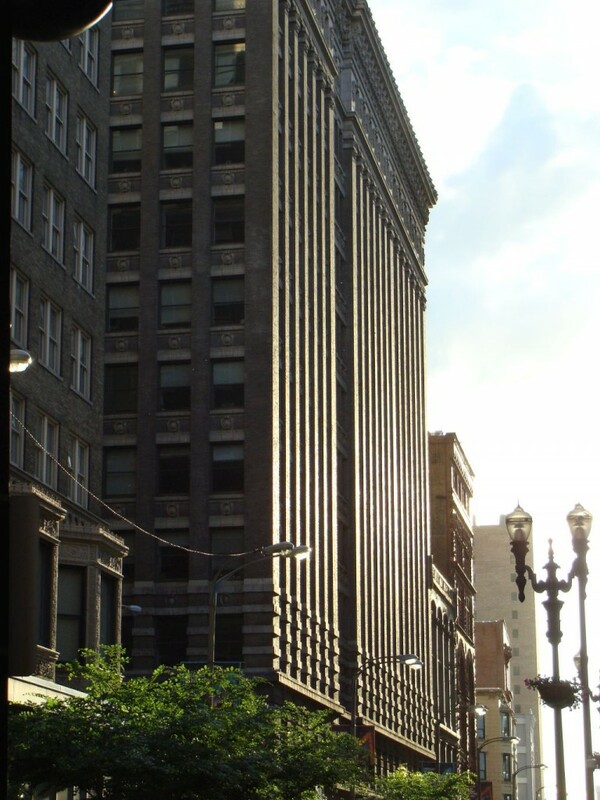 The building was constructed to wrap around the previously built and slightly taller Wright Building; inside the difference in floor height requires short flights of stairs between the two buildings. The building was famous for its jewelers at the height of its prominence. Read about the Arcade Building; see it on the map. One of the few major historic skyscrapers in downtown that was never abandoned, the Frisco Building was completed in 1905 and designed by the famous Eames and Young firm. Showing the strong influence of Louis Sullivan and the Chicago School, its clean lines and simple ornamentation work well. Read about the Frisco Building; see it on the map. Built in two phases in 1896 with a 1902 addition, and designed respectively by Henry Ives Cobb and later Mauran, Russell & Garden, the Chemical Building is perhaps one of the most interesting turn-of-the-century skyscrapers facing the Old Post Office Square. Its bays extend the whole height of the building, and its ornate terracotta ornamentation make this an interesting and florid example of the Chicago School. Read about the Chemical Building; see it on the map. Designed by the firm of Emery Roth and Sons of New York, and completed in 1969, the Laclede Gas Building is St. Louis’s most prominent example of Modernist skyscraper design as pioneered by the likes of Ludwig Mies van der Rohe and Le Corbusier (Another on-line resource on latter can be found here). Its sleek, black lines contrast greatly with the heavily ornamented surfaces of the nearby historic skyscrapers built of terracotta and brick. 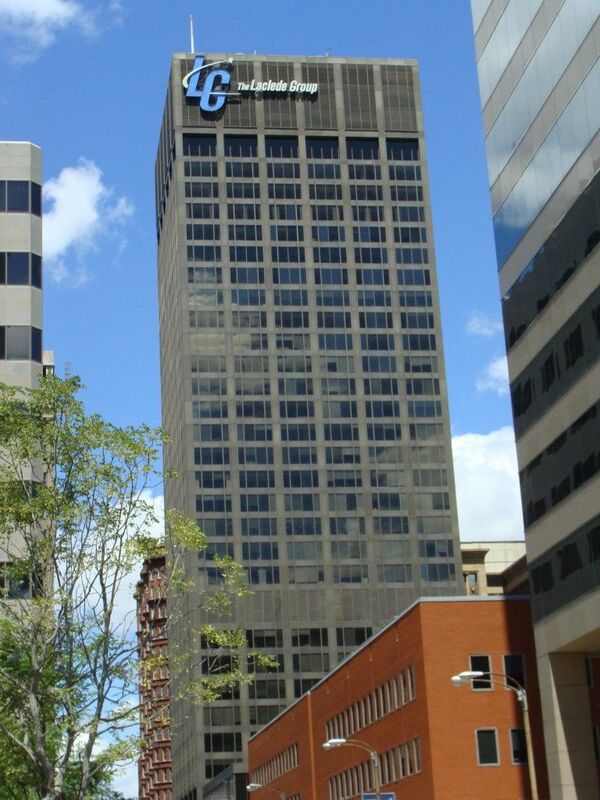 Read about the Laclede Gas Building; see it on the map. 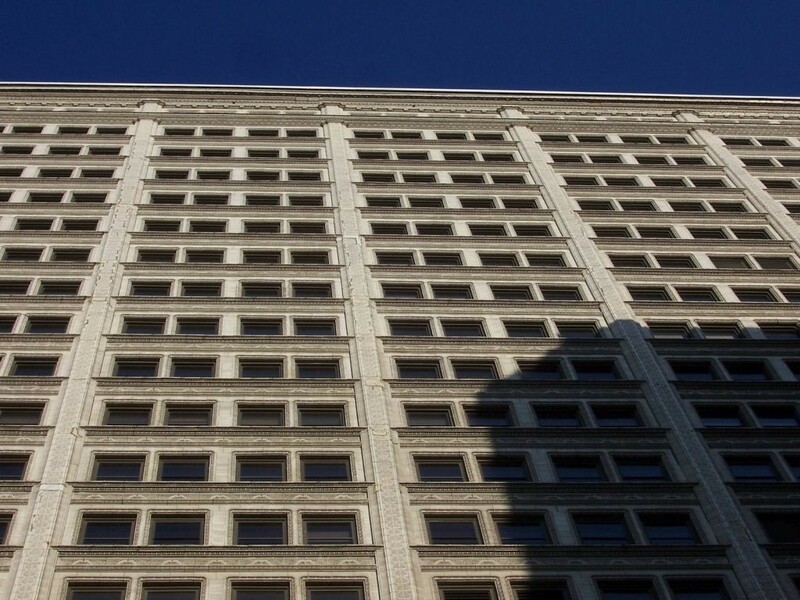 The beautiful Marquette Building, completed in 1915 according to plans by Eames and Young in the Chicago School style, originally housed Boatman’s Bank. Its cornice restored and radio antenna removed, the building was one of the first historic office buildings in downtown to be renovated into condominiums. 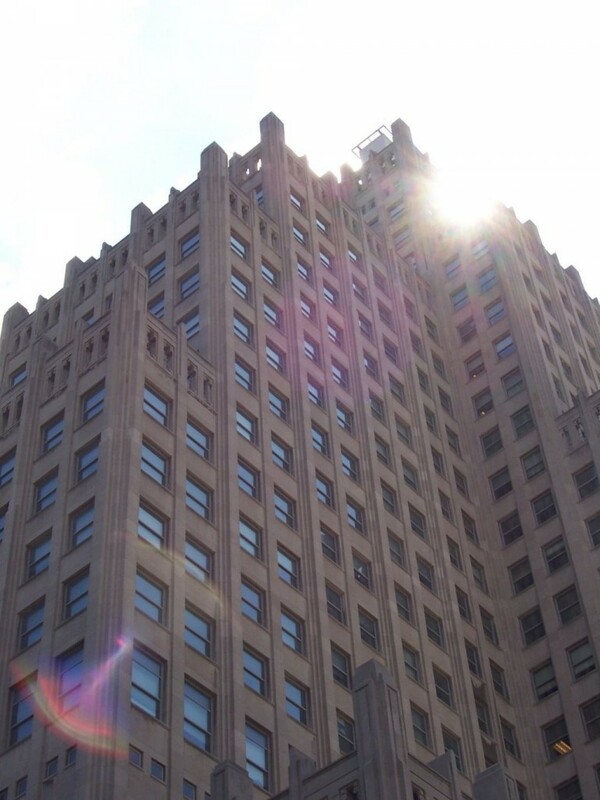 Read about the Marquette Building; see it on the map. 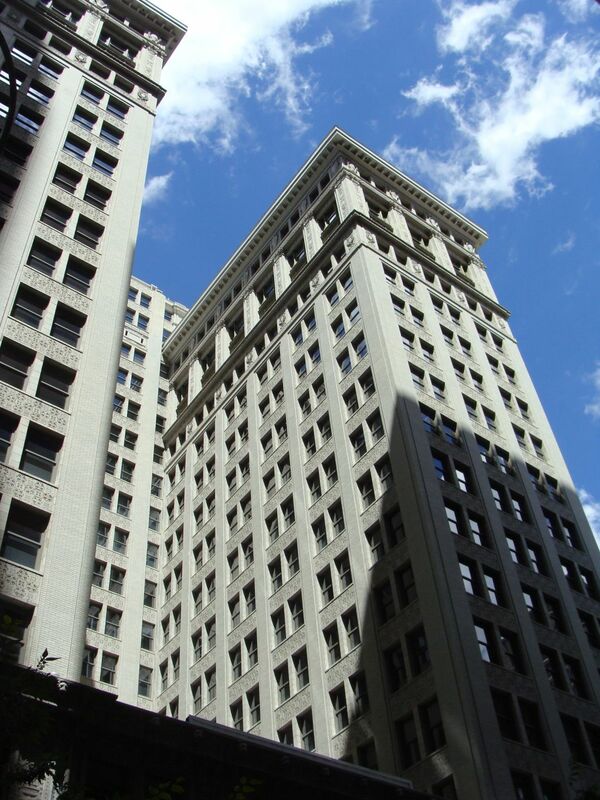 Completed in 1891 in the Romanesque Revival style and designed by the firm of Peabody, Stearns, and Furbe, the Security Building sits on what was once known as the Wall Street of the West. 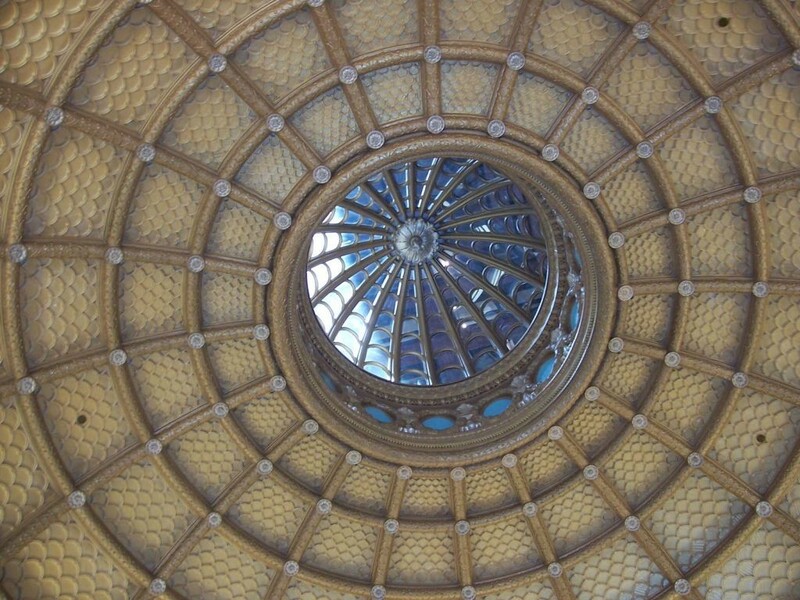 Perhaps it is best known for the distinctive dome over the lobby, now hidden by the construction of an adjacent parking garage. Read about the Security Building; see it on the map. The Bell Telephone, designed by the firm of Mauran, Russell and Crowell, and completed in 1926, can be best described as a Chicago School skyscraper with the influence of New York setbacks. It was the tallest office building in St. Louis for decades, and points to what could have been a much more robust culture of tall buildings in St. Louis before World War II. 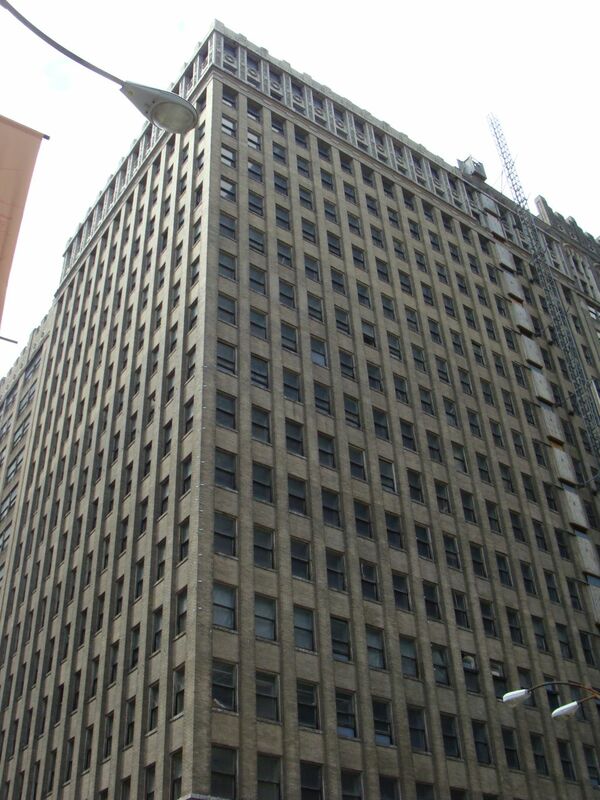 Read about the Bell Telephone Building; see it on the map. Long the home of Scruggs-Vandervoort-Barney, the Syndicate Trust Building (built as the Century Annex) opened in 1907. Designed by Henry Roach, this soaring, magnificent Chicago School skyscraper originally boasted unpainted red brick on its exterior. It has since been renovated into apartments and condominiums, which sadly came after the demise of its marble clad and slightly shorter conjoined neighbor, the Century Building, was demolished for a parking garage. Read about the Syndicate Trust Building; see on the map. The largest building in the world when completed in 1914 according to the designs of Mauran, Russell and Crowell, the Railway Exchange Building was originally intended to be the headquarters of St. Louis railroads on the upper floors and a massive department store on its lower levels. Unbeknownst to many, it features a large light well that extends down through the office levels. Ornately clad in white terracotta, the Chicago School building is a St. Louis landmark. Read about the Railway Exchange Building; see it on the map. Designed by the dynamic architect Preston J. Bradshaw and completed in 1926 in the Chicago School style, the Paul Brown Building is one of three historic office buildings taking up an entire block of downtown. Renovated into apartments, the Paul Brown actually rests on the foundations and first floor of an earlier office building. Read about the Paul Brown Building; see it on the map. 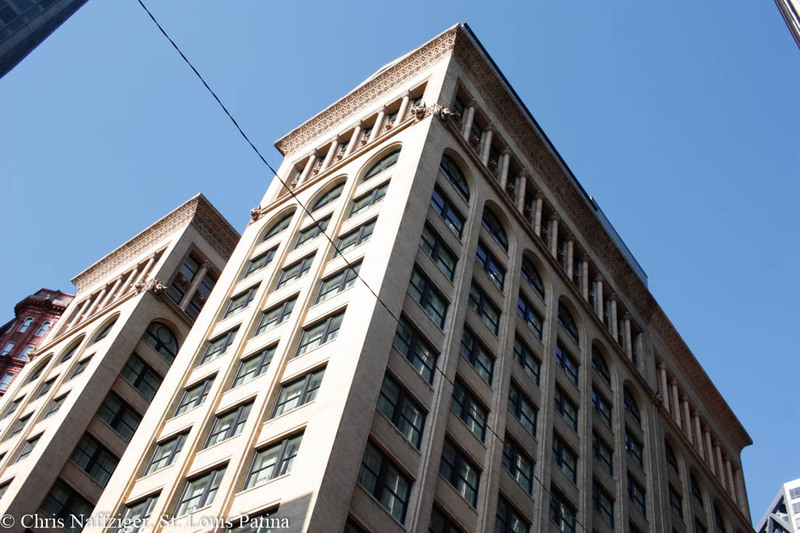 The significance of the 1892 Wainwright Building, designed by one of America’s most influential architects, Louis Sullivan, cannot be overstated. 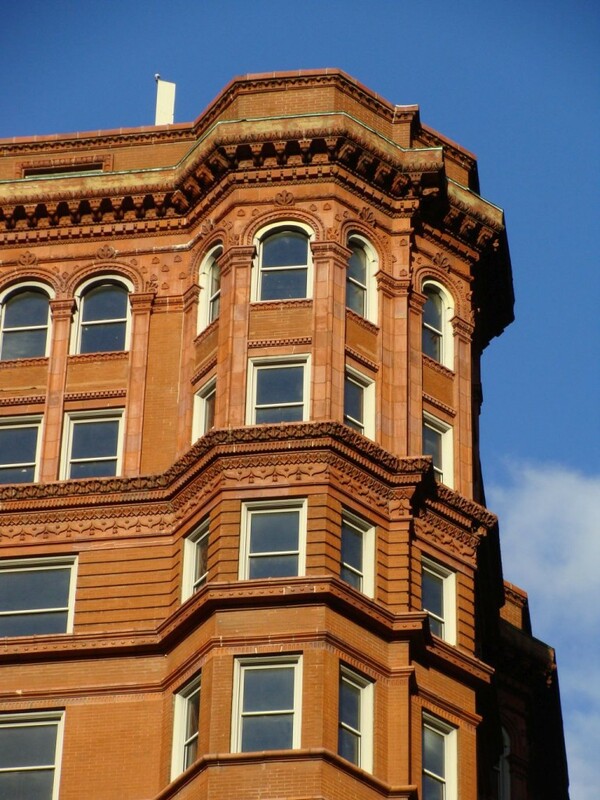 Pioneering a new, original language for the skyscraper with its long vertical lines overpowering its horizontal lines, and imaginative ornamentation in terracotta and brick, the Wainwright was the first Chicago School office building in St. Louis. 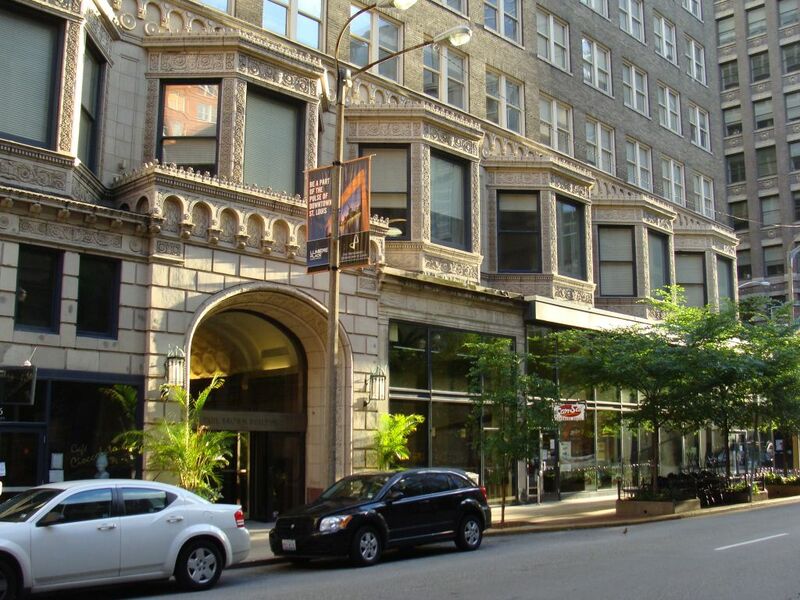 It is one of two remaining Sullivan office buildings left in St. Louis out of an original three. 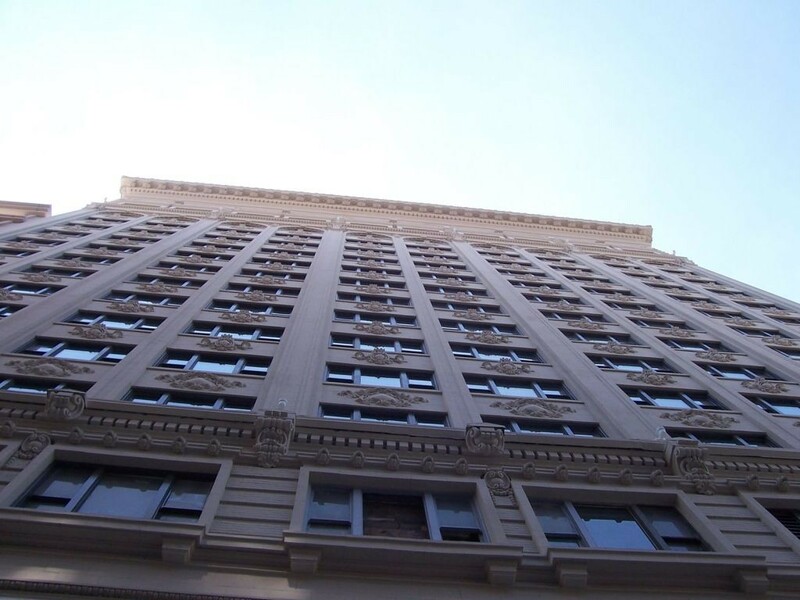 Read about the Wainwright Building; see it on the map. Modeled off the ancient Mausoleum of Halicarnassus, this Beaux-Arts masterpiece by Klipstein and Rathmann opened in 1929. I hesitate when I call this building Beaux-Arts, since it was already beginning to show a restraint and severity that was absent from the American Renaissance of architecture. Nonetheless, its slender profile, capped with an Ionic colonnade and stepped pyramid, has become a St. Louis icon. Read about the Civil Courts; see it on the map. Designed by Eames and Young and opened in 1907, much of the identity of the Wright Building has now been subsumed by the enveloping Arcade Building that surrounds it. Nonetheless, the Wright Building displays a simple, largely unadorned example of the Chicago School in St. Louis. Read about the Wright Building; see it on the map. 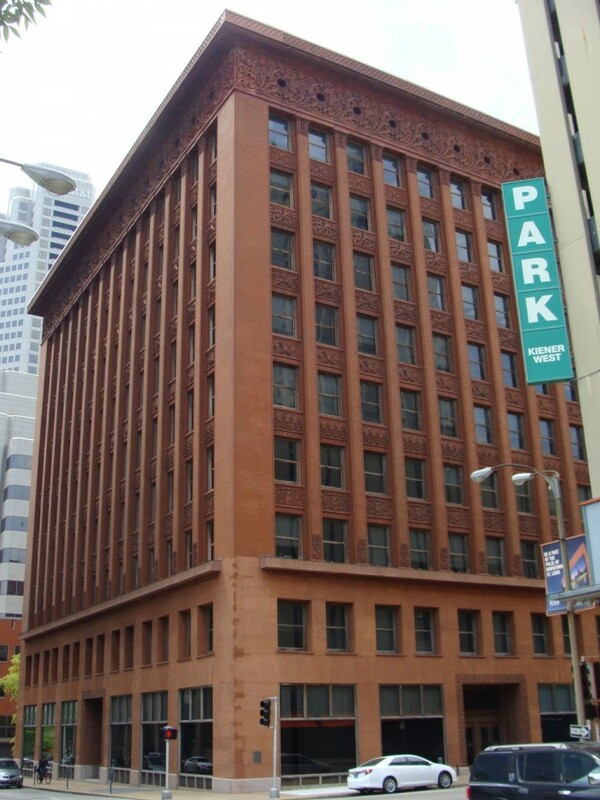 The other extant work by Louis Sullivan in St. Louis’s downtown is the 1893 Union Trust Building, another great example of the architect’s Chicago School style. Interestingly, this building once originally sported round windows on its second floor (still visible along the alley) that were later removed and replaced with a more several square fenestration. The building has never been abandoned and is still occupied. Read about the Union Trust Building; see it on the map. One of the oldest major buildings in downtown, the Old Post Office is a giant Second Empire edifice designed by Alfred B. Mullet, and was constructed between 1873 and 1884. 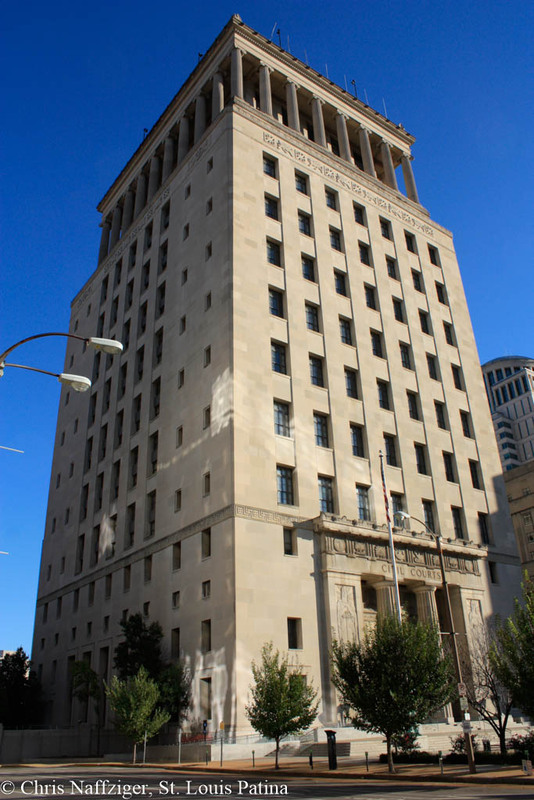 While there are many buildings in St. Louis in the Second Empire style, the monumental breed of that French-inspired seen in the Old Post Office features rank after rank of columns and windows more akin to the architecture of Michelangelo’s Laurentian Library or New Sacristy. 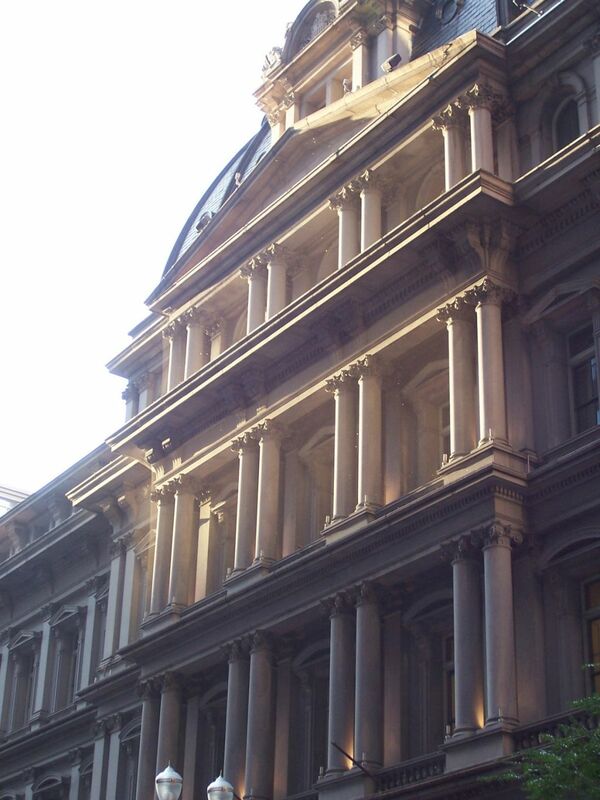 The Old Executive Office Building in Washington, DC is the Old Post Office’s closest cousin. Read about the Old Post Office; see it on the map. Opened in 1894 and designed by Theodore C. Link and Edward A. Cameron in what could best be described as a Romanesque and French Renaissance Revival hybrid style, Union Station was once the largest and busiest train station in the world (although certainly other cities had more overall traffic divided amongst numerous smaller terminals). 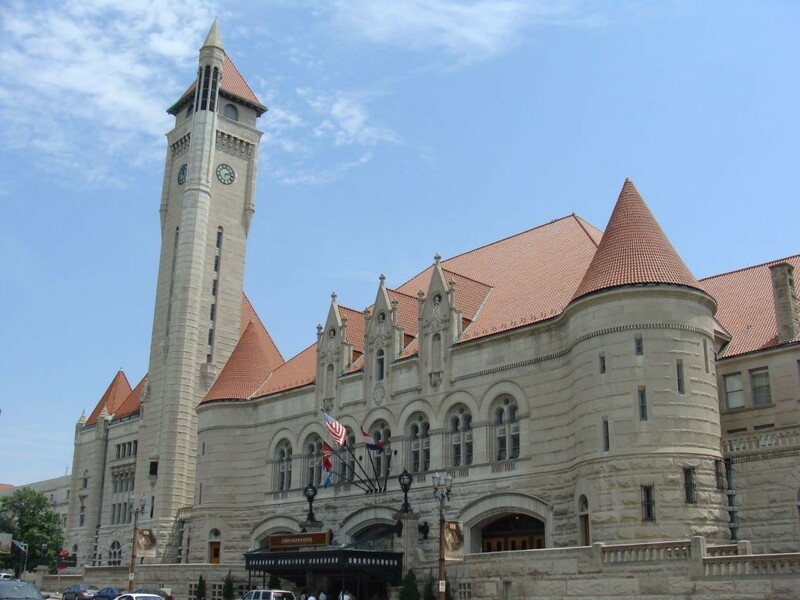 The head house, facing Market Street gave St. Louis a grand front door to great arriving visitors, and its renovation into a mall has only proven partly successful; the hotel thrives while the shopping area in the massive train shed sits mostly vacant. Read about Union Station; see it on the map. 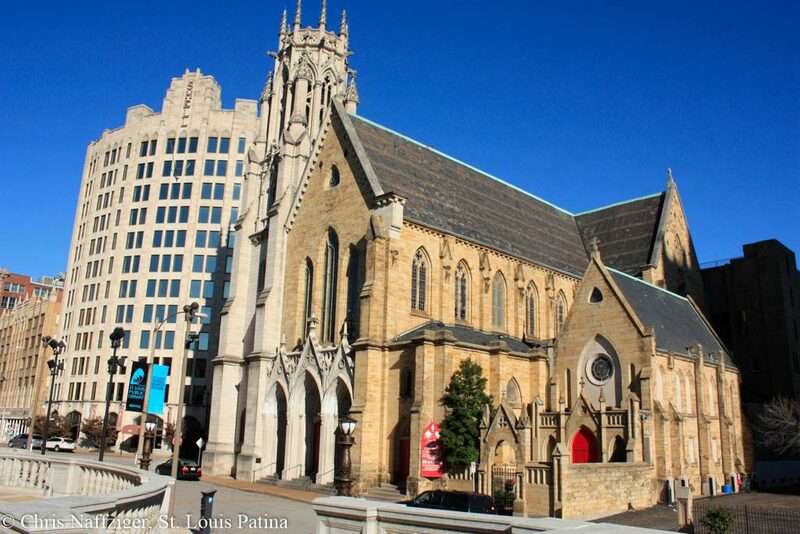 One of the oldest surviving churches in St. Louis, the Episcopalian Christ Church Cathedral occupies a quiet corner of downtown across the street from the newly restored Central Library. It was constructed between 1859 and 1867 and designed by Leopold Eidlitz in the Gothic Revival style. Perhaps what is most notable about its exterior is the strong contrast between much softer, almost brownish sandstone of the nave and transepts, and the gray limestone of the tower. The current bell tower, with its distinctive gray limestone and later Flamboyant Gothic style, stretches up on the northwest corner; ironically, it is poorly out of proportion to the rest of the church and does not match the much more muted tone of the rest of the cathedral. The front portal also matches the tower. Built decades later from 1910-12, the tower and front portal perhaps capture the often disjointed compositions of real Gothic churches that were often built over the course of generations and frequently switching or modifying styles in the interim. Interestingly, the designs, while implemented by architect Kivas Telly, were supposedly designed by Eidlitz himself. Read about Christ Church Cathedral; see it on the map. 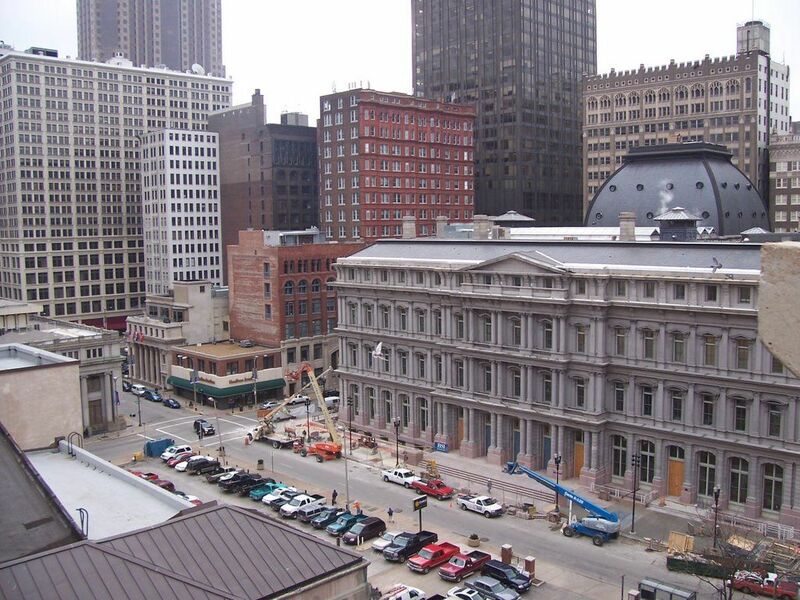 The Central Library, by Cass Gilbert, is a masterpiece of the Beaux-Arts style, a triumph of combining ancient influences from Greece and Rome, with the best of the Italian Renaissance. 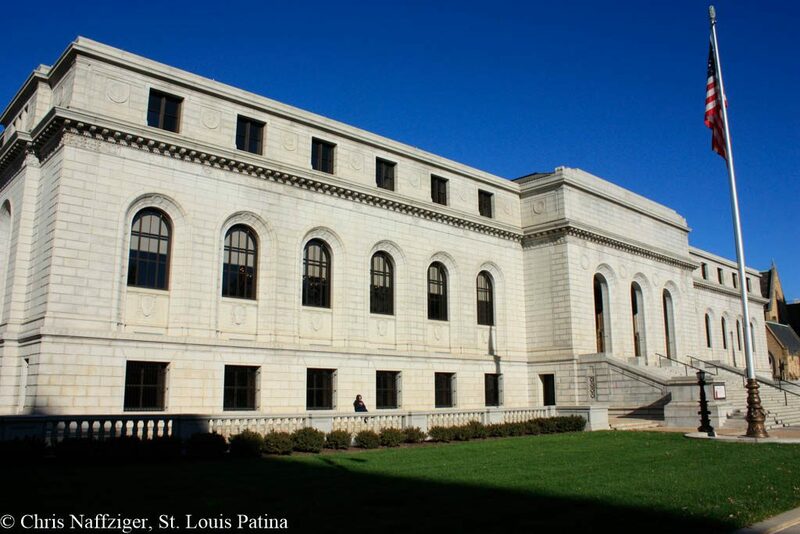 The main branch of the St. Louis Public Library system combines elements of the Tabularium, the ancient Roman records hall with the Barberini and Farnese palaces built in the 16th and 17th Centuries. Read about the Central Library; see it on the map. For more information about the architecture of downtown St. Louis, see Rob Power’s masterful overview at Built St. Louis. St Louis does have it’s share of beautiful buildings,in traveling through other cities you always notice their skylines,especially a place as beautiful as Dallas and many others,you notice that what makes their downtowns beautiful is the juxtaposition of modern and old,you just don’t see any new construction in St Louis,is it because there is no demand? Obviously,but that is exactly what will spur renovations of existing historical buildings. 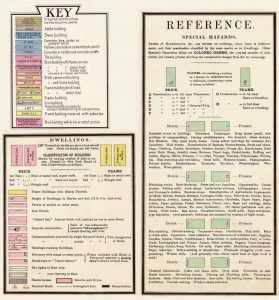 Excellent overview. Please consider adding the Central Library. The comment on the Bell Telephone Building regarding the possible evolution of more taller skyscrapers in downtown Saint Louis is right on target…for some reason (I do ‘t know why it happened), Kansas City, Missouri “overtook” Saint Louis, Missouri in having more taller buildings downtown in the 1910s-1920s. I’ve no idea why. Please let me know if there’s reasons for this. I have none to offer, but it is an intriguing issue.